The software synthesizer has come full circle. What was once possible only with a mid-range desktop computer is now easily accomplished with a sub-$200 device that rests in your hand and sips power. That transformation, once something people regarded in some vague time in the future, is now one that’s very present. I expect a lot of the hand-wringing about the future (some of it from me) comes from the uncertainty about just what it’ll mean. For some small glimpse, though, it’s nice to get to talk to Propellerhead CEO Ernst Nathorst-Böös. ReBirth is a tool that convinced a lot of people that computers could stand in for dedicated music hardware. Now that it’s on an iPhone or iPod touch or iPad, there’s no question we’ve reached a benchmark. Ernst was nice enough to send some thoughts on a Saturday evening. (I do think he used a QWERTY keyboard to do it, so please, let’s refrain from too many prognostications about how new devices will eliminate the need for furniture or oxygen, etc.) There are some interesting thoughts here, and I expect fuel for others contemplating what to do with new mobile devices. And yes, this is a direct port: believe it. There’s a lot these plucky mobile chips can do. Peter: What made you guys decide to make the leap? How did it come about? Ernst: We’ve been watching the iPhone/Touch/iPad development closely. Monitoring what others are doing, thinking about how it fits in what what we are trying to achieve. And honestly, I haven’t personally seen anything yet that really points to the future in the way I have seen it happen a couple of times before in my life (MIDI, computers, DAWS, the whole incredible transition we’ve been going through in the years since I started making music). It’ll happen, that’s for sure, it just hasn’t yet. And Rebirth for iPhone is not that. It is a comeback of something that changed the scene as long as thirteen years ago. 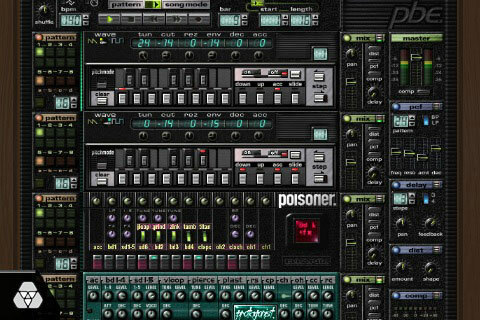 There’s a bit of nostalgia involved, but truth is, the program amazingly enough still beats the s*** out of a lot of what is going on iPhone right now, when it comes to inspiring you to create and experiment and actually make a whole track. Which is exactly what the app was about all the way back in 1997. As for how it came about, the ReBirth idea had been lurking in the back of our heads since long and then the opportunity to work with Retronyms came about and – well, we just did it. We imagine people using it in may ways. To kill some time on the bus. To try ideas and get inspired. To create beats and loops for other compositions. To work together with friends, collaborate and exchange ideas. And hopefully in ways we haven’t thought of. The sharing features we have now are very functional and straightforward. You just upload the doc and tell your friends about it so they can access it. However, it’s easy to dream up extensions to those and we will monitor closely how people use it and what they will be asking for. I see that right now it just scales to the iPad; are you planning an iPad-native version? We never comment on future releases, simply because we don’t want to disappoint anyone. But of course we are looking at the iPad. But there are a lots of things we want to do. The iPad is a slightly different beast, compared to the phone and Tocuh and we prefer to get it right rather than to be first. How different is this from the original ReBirth, aside from the obvious difference of using touch? In terms of sounds and features, were you able to add anything? Did you have to compromise anywhere to make it run on these devices? This is a 100% port. It sounds exactly the same and is completely file compatible. No compromises. We only omitted functional stuff, like being able to load any Mod. But no, nothing added either, except sharing. It’s cool that the iPhone doesn’t have a file system, but it also forces you to think differently and we don’t want to try to put round pegs in square holes. I have to ask – are you concerned at all with all of these little widgets that this thing is hard to see? We worked hard on the navigation, the zooming and panning, to make it feel natural. It was hard since there are so many controls on the screen (look at the 808!) and you need to move around quickly and fluently while never risking changes to the document. I really like how it turned out. than it does with a mouse. Is this something you think about, as well? I completely agree. The hardware metaphor is serving us well, but it’s just one way to go. But on something like the iPhone and iPad it really makes a lot of sense, maybe even more than in a mouse controlled environment. However, if you ask me, those control surfaces that you connect to control aspects of the software you are already running on your computer just don’t cut it. Then a hardware control is actually better, at least in in my personal opinion. Apple’s devices are all integrated, touch interface and machinery in one, and that’s a completely different thing, very exciting for the future!